For more on Avezzano and Luminary Visuals Studio’s work with the URSA Mini 4.6K see the press release below. 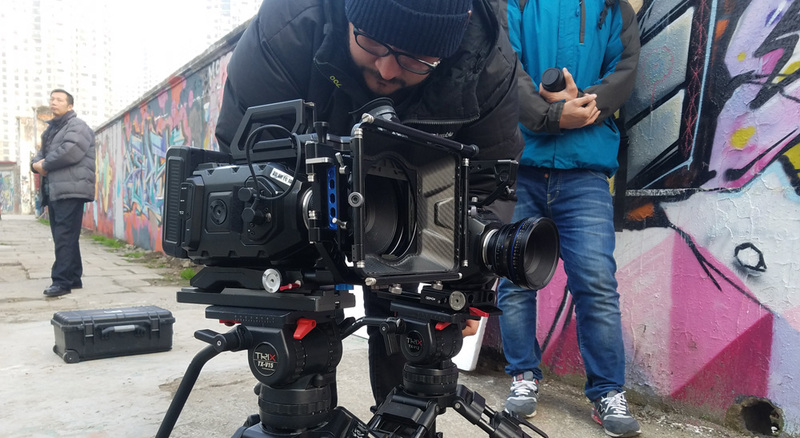 Beijing – June 8, 2017 – Blackmagic Design today announced that Shanghai based Luminary Visuals Studio produced a new commercial with URSA Mini 4.6K cameras and DaVinci Resolve Studio for Garibaldi Watches, which claims to be the maker of the world’s thinnest denim watch. Luminary Visuals is a boutique production studio based out of Shanghai, known for their creative high level work for renowned brands such as Subway, MG Cars, Superdry, Bose and Hilton. Having worked previously on a kick-starter campaign with Garibaldi Watches, Luminary Visuals was given free reign to creatively come up with something cool within a small budget. “They wanted us to show versatility in the brand, and how their watches are adaptable to all styles and professions. I decided early I wanted to do something more cinematic and to use this project as an opportunity to try a new technique in editing,” said Alessio Avezzano, Creative Director of Luminary Visuals. The new technique Avezzano wanted to try is the zoom effect used extensively throughout the commercial to switch the shot between a close up of the watch and a larger scene that gives viewers an idea of who is wearing the watch. To create the zoom effect, he needed two cameras. “This was a very small budget, but we wanted to still get high end results. I was really excited to use the URSA Mini 4.6k and at the cost we were able to rent two for the zoom effect you see in the film,” Avezzano revealed. The two URSA Mini 4.6K cameras were set up next to each other, one with a 35mm focal length and the other with an 85mm. During action scenes the actor was asked to freeze while Avezzano ran in closer to get a 100mm macro shot of the watch. The commercial was recorded in ProRes 422. “I knew the URSA Mini 4.6K is able to capture various high quality formats, ranging from RAW to different flavors of ProRes. The 4.6K ProRes 422 format was suitable for this project because I required to zoom in editing without losing image detail. Actually nowadays I tend to shoot more in 2k ProRes 444, which still gives me an unbelievable image.” he continued. “We had to shoot everything within one day at eleven locations, which meant moving very fast across Shanghai from 6am to sundown. The URSA Mini 4.6K cameras allowed us to move as fast as we needed due to its compact size,” he recalled. Color correction for the commercial was completed in DaVinci Resolve Studio. “The URSA Mini 4.6K and DaVinci Resolve were clearly made for each other. The experience is seamless!” said Avezzano. “After using it on the Garibaldi project, I fell in love with the color science and cinematic look of the URSA Mini 4.6K camera. We had previously owned a much more expensive camera and rented bigger cameras depending on the job. But with the URSA Mini 4.6K, I realized what a great investment it would be. Now I’m a proud owner of this camera and I won’t need to rent bigger cameras as much any more as I will get high end results at an affordable cost,” he concluded. Product photos of URSA Mini 4.6K, DaVinci Resolve Studio and all other Blackmagic Design products are available at www.blackmagicdesign.com/press/images.